Thomas Hardy is my favourite writer. There is no one else who can quite make me become so involved in a book that I don’t want to put it down, and even then, the stories and characters are with me long afterwards. I first discovered Thomas Hardy when I studied The Return Of The Native for my A Level English literature class. I was immediately drawn into the dark, disturbing world of Egdon Heath and the mysterious characters of Eustacia Vye, Wildeve, Clym and Thomasin Yeobright. I also found it fascinating studying the book, understanding what was going on behind the literature. After my A Levels, I began to search out more of Thomas Hardy’s work and discovered a whole collection of magnificent works. Tess Of The D’urbervilles is now one of my favourite books. During my studies, I decided to take a trip down to Dorset, to explore Hardy’s Wessex. So in 2002, I set off with my parents for a camping holiday with a difference. For the next few days we spent hours exploring Hardy’s world: the cottage where he grew up in Lower Bockhampton, his house in Max Gate, the graveyard in Stinsford where Hardy’s heart and his wife’s bodies were buried and Dorchester Museum. It was one of the best adventures that I have ever been on and I learnt so much more about my idol. Even when I read a Hardy book now it gives me goosebumps and I long to be able to write in that dark and descriptive way that he did. So I’m going to take you on a tour, through Hardy’s Wessex, with the aid of some of the photographs that I took! Lets start with his birthplace: the thatched cottage at Lower Bockhampton which was built by Hardy’s grandfather in 1800 and surrounded by the land which Hardy reinvented as the heath in The Return Of The Native. As we walked the path leading to the cottage, new houses and forestry all around us, we could only imagine the expanse of Heath land in Hardy’s stories. Information told us to watch out for glow worms in the surrounding shrubbery. This reminded me of a particular scene in The Return Of The Native where Wildeve and Diggory Venn play dice by the light of the glow worms when their lamps go out. Suddenly the world described in Hardy’s novels is evident everywhere. A little further down the path is the entrance to the cottage. Stepping inside the grounds, the first thing I notice is the beautiful garden, set alight by rows and rows of beautiful flowers. Gerberas, michaelmas daisies, buddleia, roses… a continuous selection of summer blooms, rising up in front of the cottage almost disguising half of its form. Behind this stands the cottage, large and very impressive. I am struck by its size, it seems very long, very high, its thatched roof capping its shape like an immaculate haircut! Everything about it is extraordinary: the small wooden windows, the open doorway, the apple tress overhanging the garden, the vegetable patch that we assume has been added to show how they relied on the land. Hardy was born in this very cottage on 2nd June 1840. The extraordinary story of his birth suggests that on first sight of the child, he was at first thought to be dead and tossed aside. Only after he began crying moments later did it become clear that he was in fact alive and healthy! Hardy grew up in this rather cramped cottage with his brother and sisters (he was one of four). He walked to school through the surrounding woodland every day, a three-mile walk from his isolated home. And it was from the small window in the bedroom that he would gaze out across the woods and imagine his stories. 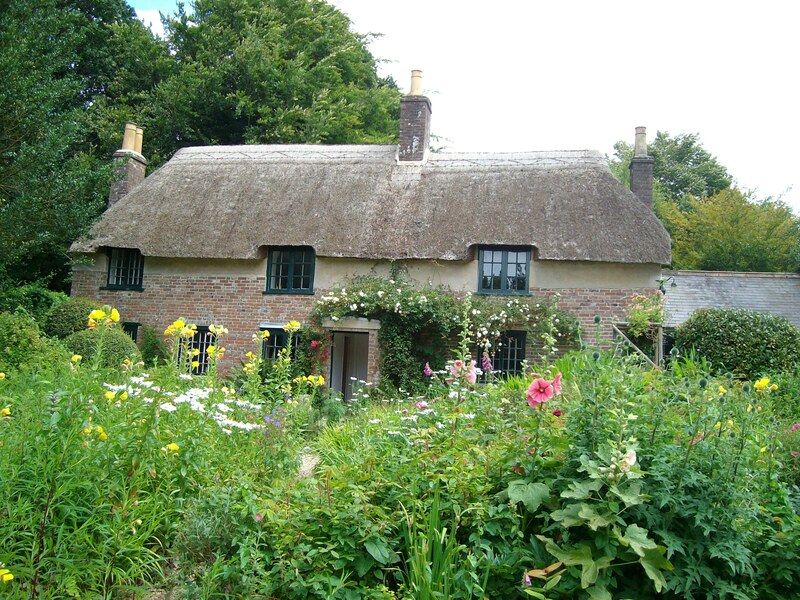 The cottage was where he wrote such classics such as Under The Greenwood Tree and Far From The Madding Crowd. The first room we enter is the kitchen. This was where the family sat together, ate and entertained. Hardy used to play the fiddle to an audience of family and friends. I was surprised how small the room was; there was a table, chair and fireplace complete with bellows, poker and kettle. Upstairs there are three bedrooms. The first Hardy’s sisters shared and the second Hardy’s parents room; both were very small with basic furniture and small windows looking out over the garden. The third room belonged to Hardy and his brother. It was from here that Hardy would look out and imagine the world of his many poems and stories. And he wrote his first poem at 16, which still hangs framed in the downstairs office at the cottage. He would return often to the cottage after his parents death as he found it an inspirational place to write. His brothers and sisters lived there together long after Hardy left and continued to live together elsewhere later in life too. Aged 16, Hardy began an apprenticeship with Hicks, a local architect. He left for a time and went to London, where he gained work repairing and designing churches and Rectory houses. When he returned home due to ill-health in 1867, he took up work for Hicks once again. And it was on a reluctant trip to Cornwall in 1870 that he met his first wife Emma Lavinia Gifford. His novel A pair of Blue Eyes, which was first published in serial form, is said to be based on his courtship with Emma. Going against his mother’s wishes that her children stay unmarried and living together, in 1885 he married Emma and they moved into Max Gate, a house which he designed and his father built. We visited Max Gate on the second day of our trip. As I walked down the long drive and the house came into view, the first thing that struck me was how small and modest it was. However, as they never had any children, it suited Hardy and his second wife Florence very well. On looking up at the house, and admiring the brick work and design, it’s hard to believe that it was designed by Hardy himself. There is a sundial on the east side of the front wall of the building which Hardy’s second wife Florence Dugdale, had added to the house after his death. It’s believed that the name ‘Max Gate’ came from a time when the cul-de-sac outside the house used to be the main road and the cottage at the end used to be a toll house owned by a man called Mack Gate. Only two rooms were available to view for the public: The dining room and the drawing-room. After a short talk by the tenant, we took a walk around. There was quite a collection of letters, photographs and furniture. 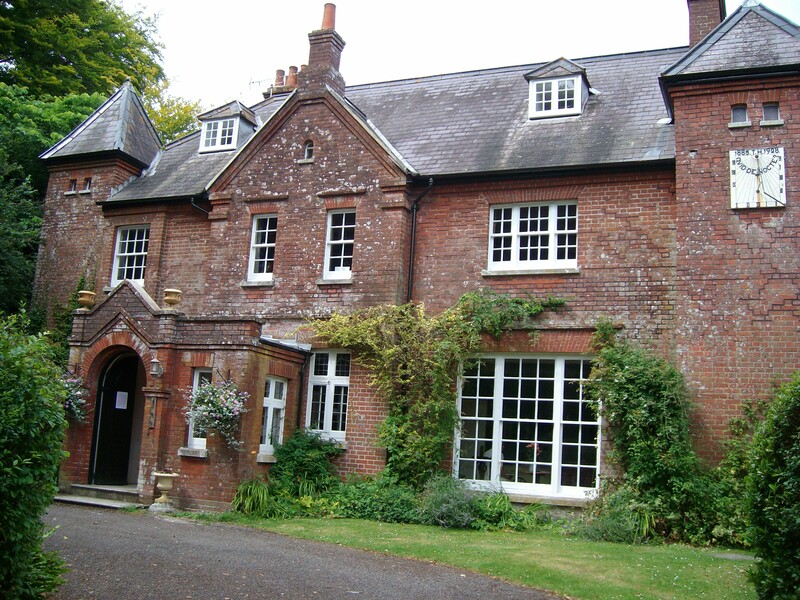 Hardy wrote Tess of The D’urbervilles and The Mayor Of Casterbridge whilst living at Max Gate. On one of the tables, was a newspaper which had printed Hardy’s The Mayor Of Casterbridge in serial form. There were also pictures and plans of the house and it’s extensions, many of which Florence requested herself, and later of Hardy’s second study. Computer presentations and photo’s told the story of Thomas Hardy’s time at Max Gate, his difficult period prior to and after Emma’s death in 1912 and his friendship with Laurence of Arabia. Hardy’s realtionship with Emma had been a turbulent one, keeping himself much to himself. But after her unexpected death in 1912, came a lyrical outpouring of poetry and he appeared to love her more in death than he had in life. Fourteen months later he married Florence Dugdale, some say a better match. 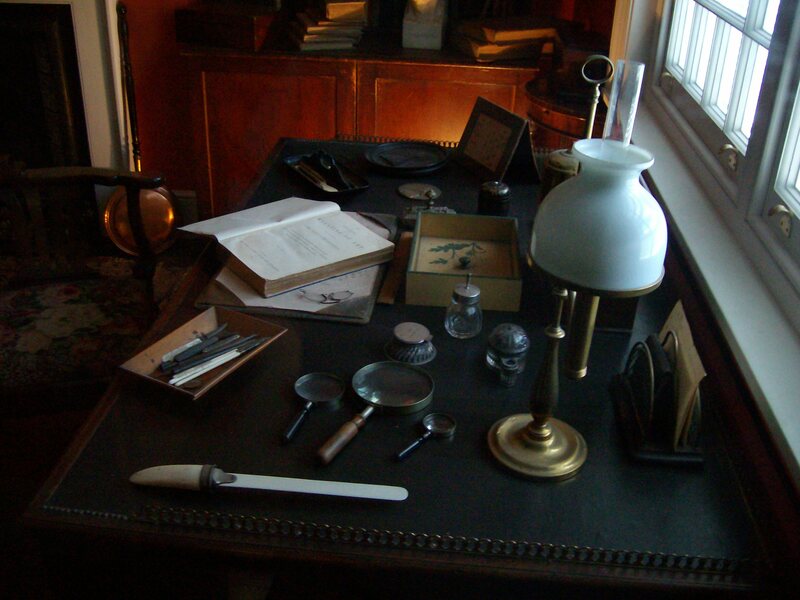 In the dining room, a mirror still hangs over the fireplace, from Hardy’s original belongings and a guide suggested I sit in Hardy’s writing chair to gain some inspiration. She claimed that the next thing that I wrote would be ‘clear genius’ I’m not sure it worked! We took a walk around the grounds of Max Gate, reading poetry in the thee corners of the garden and walking under the ‘alley of bending boughs.’ At the West of the front of the house was the pet cemetery, many of the stones carved by Hardy himself. An eerie setting amongst the trees and woods, the rounded shadow of an old, rusty wheel; belonging to some working implement of times gone by. As we walked back down the driveway I felt that I had learned something new about my literary hero. I felt closer to him; a greater understanding of his works. Later that day, we decided to go into Dorchester to have a look around. 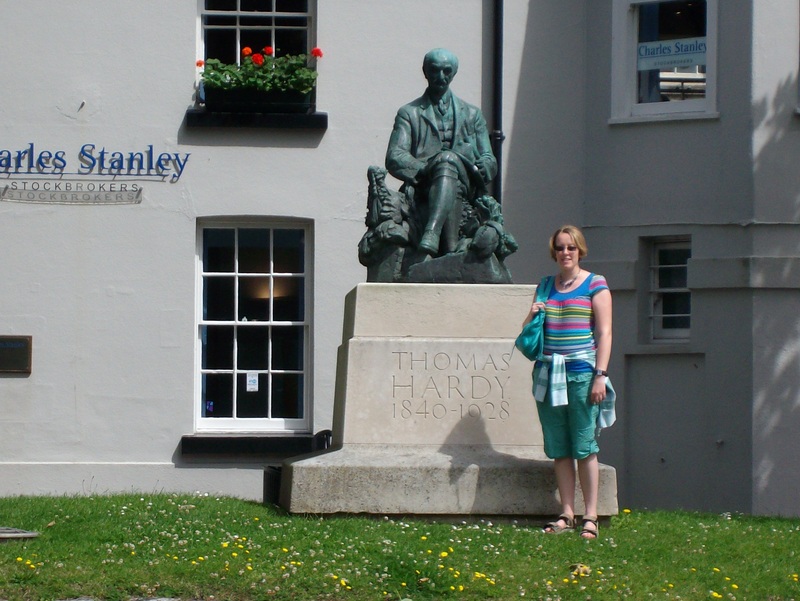 We wandered the winding cobbled streets of Antelope Walk to the Tourist Information Centre, and then up to the top of the town to see the Thomas Hardy Statue. It’s a pretty impressive statue of the writer, elevated above the base. As you can see by me standing beside it! After this, we visited the Dorset County Museum in the centre of the town. The two story museum is owned by Dorset Natural History and Archaelogical society. The museum charts the history of the town and the surrounding area, through the ages, with interseting exhibitions. Upstairs I wandered through the world of Dorset Writers, including Hardy and his close friend William Barnes. I was delighted to be able to peer into Hardy’s original study, removed from Max Gate and placed in the museum for people to see. His desk was scattered with books, papers and pens. With these simple things he had written the wonderful Tess Of The D’Urbervilles and Jude The Obscure! For the first time since our visit, I really began to see how treasured Hardy is, not just to me or to a small few,but throughout the world. People had come from all over to see this; to learn more about him. They had chosen to remember him and treasure his work. On the final day of our trip, we drove down to the small hamlet of Stinsford (known in Hardy’s books as Mellstock.) We were heading for St Michael’s church, where three generations of Hardy’s went, including Thomas Hardy himself. In the graveyard were the graves for several generations of Hardy’s, dating as far back as the 18th century. Among these were the graves of his mother and father, brother and sisters. We found Hardy’s grave below a yew tree. I had already learnt that only his heart was buried here, his ashes having been scattered in the poets corner of Westminster Abbey. I had read that Florence had fought against this, but it had been done anyway. It is confirmed in the engraving on the stonework, which also says that both wives are buried there also. A pamphlet inside the church shows a photograph of the reverend carrying a box containing the writer’s heart ready to be buried in 1928. I wonder if his heart is really buried there though, as other sources seem almost unsure of this. Inside the church, a stained glass window holds an inscription to Hardy as well as a plaque dedicated to his second wife Florence’s life and work. The church and churchyard was eerily quiet. I sat and tried to imagine Hardy and his family coming here, meeting others for the morning service after walking all the way from Lower Bockhampton. Apparently, Hardy used to walk from Max Gate, across the Frome valley, to Stinsford regularly for the service at St Michael’s. As we walked through the graveyard and I took some photographs, I felt sad that neither Hardy’s brother and sisters or Hardy himself had any children. I find it sad that the legacy ended when the final Hardy family member died. This talented and creative genius never passed on his talent. Any hint of a family trait would never continue. But perhaps it was meant to be this way. 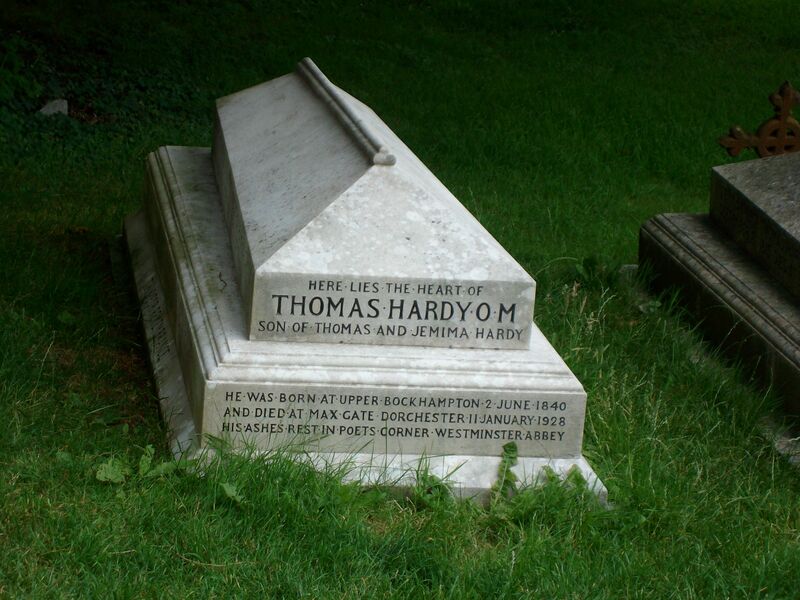 Perhaps Thomas Hardy was truly meant to be one of a kind. An original genius, a private man who found comfort and heart in the characters that he created. His work will live on to be admired for centuries. And I believe, although many have tried to imitate his great stories and poetry, they never quite will.